To paraphrase Dickens, for SME marketers it is the best of times, it is the worst of times! There is a dizzying array of strategies, tools and techniques on the market to help them reach the increasingly fickle consumer and that’s amazing. However, the flip side of that is how on earth do you identify what is a ‘must have’ versus a waste of time and money? Who do you turn to to find out? Well, that’s one of the reasons why thousands of people converged on The Business Show 2017 in Excel last week – seeking advice from successful marketers and entrepreneurs on their own industry-busting marketing strategies. As Cannes Lions welcomes its mini Innovation Festival for the second year, it’s interesting to hear speakers telling us that, while the elements that make up innovation (data x tech x ideas) are driving the changes and growth in the industry, there is also a ‘back to basics’ mentality in the minds of senior practitioners. They want to do great things and do them better – but in order to do so there is a desire to bring rigour to a lot of advertising processes that has got lost along the way. 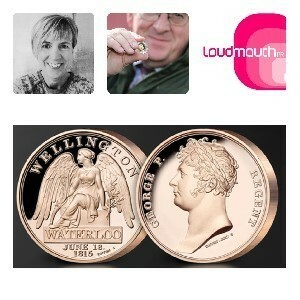 The London Mint Office has launched a PR campaign based around the creation of a new landmark memorial at Waterloo Station to reflect its status as a leading expert in producing commemorative coins and medals in the UK. Working as a partner with charity Waterloo 200 it has created the UK’s first War Memorial to honour the ordinary soldiers of the Anglo-Allied and Prussian soldiers who died at the Battle of Waterloo. New research results revealed by digital marketing technology company AudienceScience® demonstrate that senior marketers across Europe feel ill equipped to measure the return on investment they make from their digital marketing spend – hindered by the fact that the majority of client marketers are given little insight by their agencies into where their digital budget goes. With the study showing that 50% of European advertisers also expect to invest more in digital over the next 18 months, results also demonstrate that marketers have a clear desire for greater transparency across all media buys if they want to reduce waste and improve effectiveness.